Piles of paper are a pain, and managing a home filing system can be a drag. However, you do need to hang onto some documents because you never know when you'll need them. Just how long do you need to keep your taxes, receipts, bank statements, and other important documents? 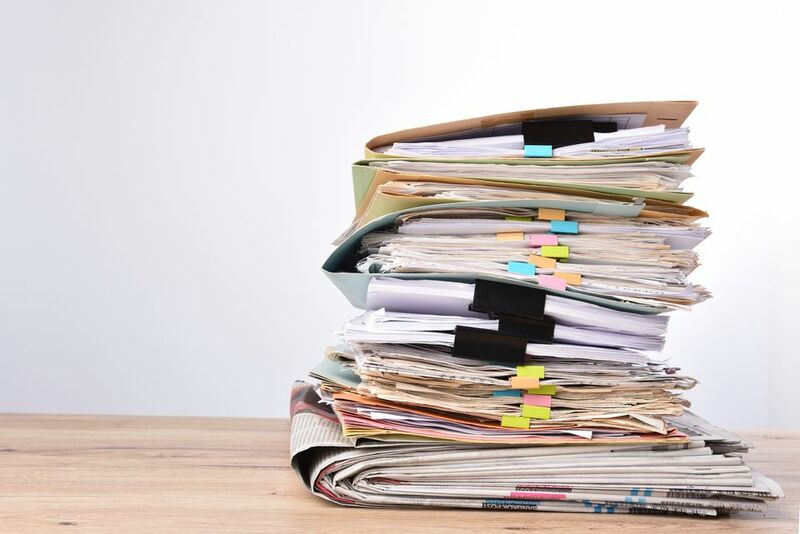 Each type of document is different so you'll want to be sure to keep all of your paperwork long enough before you fire up the shredder, even if you think you're done with them. One key to creating a workable home filing system is to start cutting down on the amount of paper you receive. It can really reduce the amount of paper you'll have to shred or file. This means getting rid of junk mail, signing up for e-bills, and not accepting flyers, coupons you'll never use, or other ephemera you feel like you need to hang on to when you know you really don't. If you let this presorting stage get out of hand, you may really begin to struggle with paper clutter. It can even get to the point where you feel like you may be hoarding it. In these cases, it can be very helpful to reach out to a professional who can guide you through the decluttering process. The second step is to make sure you have a good mail management system in place. The more efficiently you handle the mail when it comes in, the less often you'll have to do a big session of filing, shredding, and recycling. Getting rid of your paper filing by setting up an electronic filing system will save you space and rid you of paper clutter. Nowadays, an electronic filing system makes a lot of sense because it's easier than ever. To get started, you need a scanner and a place to store your files: a folder system on a computer and a back up in the cloud, as well as an external hard drive. The more backups you have—at home and off-site—the more prepared you will be to ditch the pile of paperwork without worrying about losing something important. Set up general folders for different types of documents (e.g., household, taxes, auto, birth certificates, etc.) You don’t need to get too precise with storing the documents since electronic filing systems are searchable. Then, scan each document and store it in a folder according to the contents. Be sure to give each a unique filename to describe it so it can be found quickly via your computer's search function. Also, adding the date at the end of the filename can help you distinguish the same type of document from different time periods. For example, rather than calling your utility bill utilitystatement.pdf, name it utilitystatement-Feb2019.pdf. There are also a number of apps available that can help you quickly record and store a variety of documents. Many can be managed through your smartphone or tablet, so you can get rid of paperwork (especially receipts) when you're nowhere near your home computer. For your most important documents, experts advise keeping multiple copies. That may mean keeping one copy in your cloud storage and another on a hard drive. It could also mean keeping one copy in your electronic filing and one hard copy in a fireproof safe. A number of documents should be stored forever. These are the most important that you may need at any time in the future for a variety of reasons. Ensuring that they're kept in a safe place and that a copy is secure will save you a lot of time when they're needed. Academic records: Diplomas, transcripts, and any portfolio work that may be used in the future when applying for a job. Death certificates: May be needed for tax purposes. Employment records: Any clauses, agreements, disciplinary files, and performance reviews. Imagine having a lifetime's worth of bank statements and bills piled up on your desk! After even just a decade, that stack would likely be outrageously big. There are many types of documents—mostly financial—that you should keep for a certain period of time, but don't need to store forever. You may need to reference them monthly or weekly for a while, then they just become another piece of paper lying around creating clutter. Bills: One year for anything tax or warranty related; all other bills should be shred as soon as they have been paid. Credit card bills: Shred immediately when paid. Home improvement receipts: Keep until the home is sold. Investment records: Seven years after you've closed the account or sold the security. Leases: Keep until you've moved out and have received your deposit back from the landlord. Paychecks and pay stubs: One year, or until you've received your W-2 statement for that tax year. Sales receipts: Keep for the life of the warranty for major purchases like appliances and electronics. For things like groceries and clothing, only keep the receipt until you know that it won't be needed to return merchandise. Tax documents: Seven years, including your filing and all accompanying documents like W-2s and receipts. Vehicle records: Keep until the boat, car, or motorcycle is sold. Shredding documents is the main way to protect yourself from identity theft. As a general rule, there are certain documents that absolutely should be shred. This includes anything that has account numbers, birth dates, maiden names, passwords and PINs, signatures, and Social Security numbers. If documents are still "active"—you need to hold onto them for reference—place them in your home filing system by topic. Only shred them once they are no longer in use. Everything else—like paperwork—you can just recycle. Make sure to have a flexible filing system set up so you can keep these documents in check. It's also a good idea to get in the habit of going through your stored documents on a regular basis. Try to do this when paying bills, filing your taxes, or taking care of a similar recurring task so you don't forget and your paperwork gets out of hand.